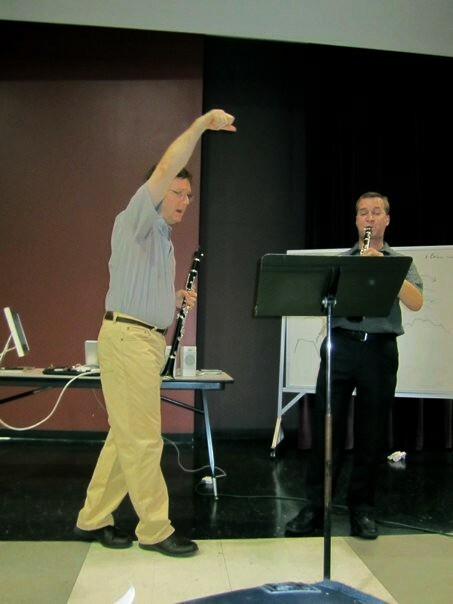 Some highlights of the week included an opening recital by Mr. DiLutis and Dr. McClellan, sessions on reed adjusting and reedmaking by Mr. DiLutis, a class on phrasing by Dr. McClellan, a mock orchestral audition, and sessions dedicated to the Mozart concerto and the Nielsen concerto. Both Dr. McClellan and Mr. DiLutis were students of David Weber at the Juilliard School, and the late Mr. Weber’s influence was omnipresent at the Academy. Evening masterclass sessions ended with reminiscences, often humorous, of their time under his tutelage. An end-of-the-week dinner in Dr. McClellan’s home turned into a “listening party” with recordings of David Weber and other fine clarinetists that fell within his sphere of influence. As the end of the week, Mr. DiLutis and Dr. McClellan expressed their intent to hold the event again next year, and to consider some variations on the format (possibly to include private lessons and more performance opportunities for attendees). I found it to be an enjoyable and educational week, at a surprisingly affordable price. Dr. McClellan and Mr. DiLutis are artists and educators of the highest caliber, and anxious to share their knowledge. Keep an eye open for it in 2012! I too, found this to be an extremely enjoyable and educational week. This experience will go a long way in improving both my teaching and performance skills. I congratulate both Dr. McClellan and Mr. DiLutis for providing an excellent experience.